SATCOM MEDIA provide customized solutions and services in the field of data, voice and video communication based on satellite-based networks. The solutions are custom designed for specific business requirements across various industry verticals including oil & gas, automobiles, banking & finance, entertainment, lottery, education, railways, defense, SCADA etc. SATCOM MEDIA has multiple hubs on multiple technologies (MFTDMA, TDMA, DAMA, and SCPC) on both Ku and C band. Satcom media PAN India presence, its tie-up with a number of franchises and 24×7 dedicated help desk is key to quick installations and effective after sales service and support. 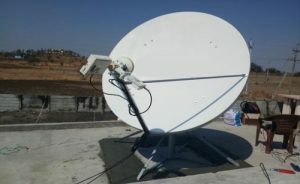 SATCOM MEDIA is one of the premier VSAT service providers in the country having a large number of installations. We have sourced and successfully absorbed almost all VSAT technologies from several leading OEMs across the world. This enables us to provide any solution in Extended C and Ku band which is best suited to customer requirements at optimal costs. All our VSAT solutions support broadband connectivity (data, voice, and video).